Watch as Davison’s Better Way to Invent turns Sharon’s Cool Cot House idea into a store-ready reality! Washington state native Sharon was your everyday housewife and mother… but, she had a bit of a problem. She wanted a comfortable, convenient place for her dogs and cats to sleep on or in while on camping trips or at home in her own backyard. While shopping in one of America’s largest retailers, Sharon noticed a small pop-up tent and thought that a real tent that size offered the perfect solution for her furry friends. Sharon often went camping & hiking and wanted a cool, comfortable, and convenient shelter for her furry friends. She could not find a product that would solve this problem, so she decided to invent it herself. The finished product, the Cool Cot House, features a water-resistant tent with a vented roof, raised bed and mesh cot designed to keep dogs and cats cool and dry. 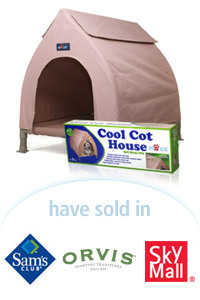 In the Summer of 2010, Sharon shared her inventing story on Lifetime TV’s “The Balancing Act” alongside George Davison and the president of Hugs Pet Products – the company that licensed the Cool Cot House. Diana knew she had to find a Better Way to keep pets like Ripley cool and safe in any condition. When Melanie came to Davison, she had already spent a lot of time and money on a patent for her idea. long with her husband, Gary, she wanted to find a way to secure loose caps to the bolts, for a better-looking, safer bathroom. Christine created the Brownie Bowl, designed to bake any type of dessert into a bowl that will hold all sorts of toppings. During a brainstorm session for a product that would use a nail to cook a potato from the inside out, Pete came up with an idea. She wanted to provide her pet with on-the-spot, thirst-quenching refreshment during her travels. Lennell who had a problem with “hot feet”, contacted Davison with an idea to soothe sore feet and toes. She wanted a comfortable, convenient place for her dogs and cats to sleep on or in while on camping trips or at home. Pittsburgh, Pa. native Julian was your everyday guy... but, he had a houseguest problem. Davison to the rescue! Jean believed making a delicious & decent meatball could be easier, more convenient and, above all, healthier! John wanted to combine the "west coast" sports of surfboarding, skateboarding and bicycling into one. Ed wanted a convenient, humane way to tether his pet without his pet's chain getting in the way and knocking over bowls. Joseph had always loved brownies with a chewy edge and used to slice a pan of brownies before it had finished baking. No more! Kay wanted to solve the bitter problem that snowy, treated roads and sidewalks caused her pets. Ever tried to travel with deviled eggs? Joy wanted to solve the messy problem that traveling with party food created.